Hello everyone, today we are not going to be discussing treadle sewing machines. We are going to ignore all the urges to discuss hand crank sewing machines. Tailed or electrified sewing machines are also going to be off the topic list as well. So what do we have left to talk about? Needles? Thread? We could delve into the different types of industrial drive systems used throughout history; all of these would be fun to get into sometime, but not tonight. Tonight I am going to share some ideas about gloves. Not just any gloves. Sewing gloves, we are going to discuss the gloves we use here in the Quilting Room. I have never been a big fan of using gloves for anything except to keep my hands warm when working outside in the winter, to keep the blisters at bay when doing heavy duty work, and to isolate the possibility of transferring germs to or from a patient when dealing with emergency situations. I always felt like gloves were a hindrance. I couldn’t pick-up small parts and pieces, couldn’t swing a hammer accurately or put nuts and bolts together. The only times I used gloves on a daily basis was when I was cutting steel or welding, and when I was working in a beef processing plant. So why would I want to wear gloves to sew with? With the sewing world migrating from the use of good old-fashioned scissors to the rotary cutter it was easy for me to transfer my appreciation of the “No Cut” Kevlar type protective gloves to the cutting table. I was a big fan of the “Can’t cut “rubberized glove long before they were introduced into the quilting world. I used them when replacing window glass around the house and when framing large photos. So to see them used on a fabric table was no surprise to me. However old habits are hard to break, and even though I do understand and respect their usefulness at the cutting table I really could not see a practical use for them anywhere else in the quilting world. BUT WAS I EVER WRONG. Here is what I learned about quilting with gloves on. 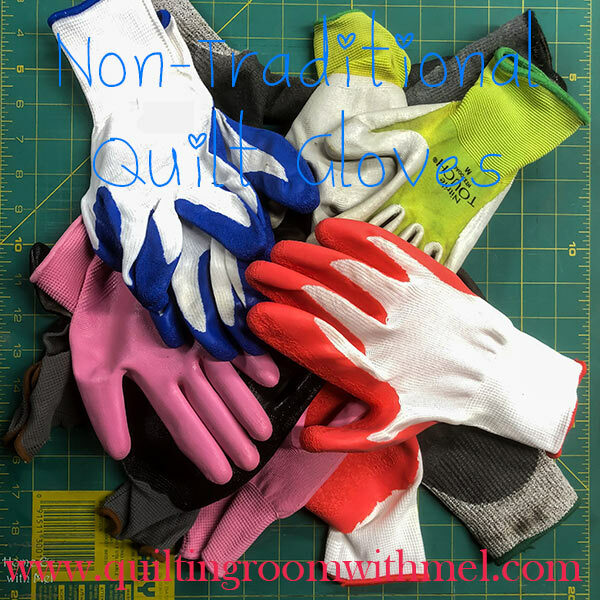 First of all, I would like to say I use two different types of gloves now in the Quilt Room, I use the rubberized “no cut” gloves for cutting and I use rubberized mechanic gloves or garden gloves to handle my quilt sandwiches while quilting. Some of the mechanics gloves are also “no cut” as well. Now the term rubberized in this instance is a vague generic term which includes Nitrile coated gloves. 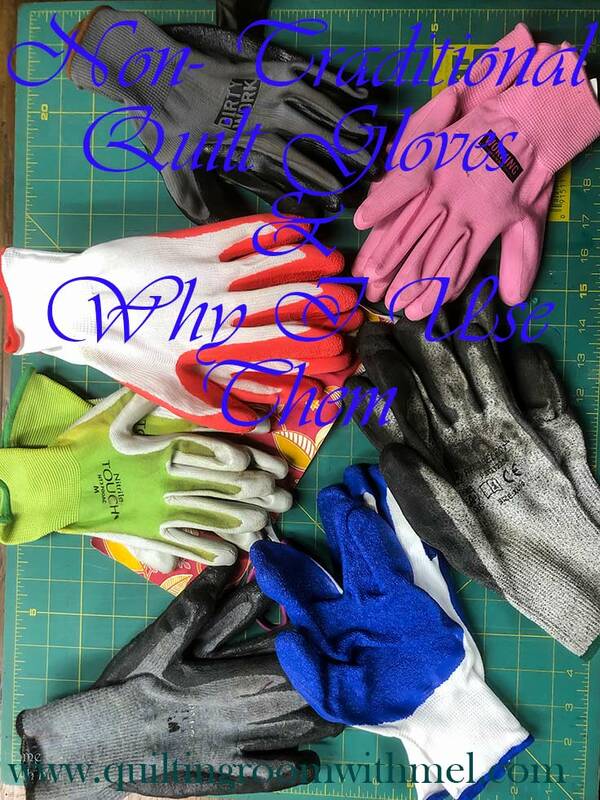 As I said earlier I use mechanic gloves or garden gloves instead of the gloves at the quilt shops and fabric stores for a couple different reasons. First of all, I can find some form of these gloves in sizes big enough to fit a man’s hand comfortably or small enough to fit the tiny hands of the grandkids or Mel. Second of all, they are generally much cheaper and they last as long as their more expensive counterpart. And even though color of the glove doesn’t bother me personally, some people are not fans of the colors available over the counter at a fabric store or Quilt shop. I am in no form or fashion trying to belittle the gloves from the Quilt shop or fabric store. I am only bringing attention to the various resources which provide the same types of gloves we use, also I am stimulating a thought process wherein we think outside the box to achieve the same results simpler and more conveniently. When it came to using the “no cut “gloves with a rotary cutter on the cutting table. The concept made perfect and absolute sense to me. But when it came to using the rubber coated gloves to handle fabric I was skeptical, to say the least. I actually laughed it off and refused to even entertain the idea. I had never known anyone who used them and I wrote the scenario off as a gimmick. I was wrong, I was served a large piece of humble pie when I was free motion quilting a large pair of quilts with a deadline due and realized my arms and hands were getting sore and hurting and I wasn’t halfway through the job. I made a comment to Mel about the toughness of some of the elderly ladies I had watched doing the same thing with no issues. She was the one who suggested that it might be the gloves they were using. I decided to put that nonsense to bed and I went out to my work van and retrieved a pair of rubberized mechanics gloves I was using to handle large sheets of sheet metal at work. Waitress, would you bring me my Humble Pie now please and thank you. And as you have guessed by now, it only took a few minutes for me to realize the error of my ways. The quilt I was struggling to grip and control suddenly moved as gracefully and effortlessly as an ice dancer. I was amazed at the difference it made, I was able to meet the deadline and my hands were no longer cramping and my arms didn’t hurt. Now it has become second nature to use the gloves. I have trouble trying to quilt without them; I now use them whenever I am handling any large piece of heavy fabric under the needle. A long story made short I hope if any of you find yourselves at the same crossroads you will be able to learn from my narrow-mindedness and give the gloves a trial run. I think you will be pleasantly surprised. Until next time keep your rotary cutter open to cut and closed to measure and your thoughts out of the box. For more tips on quilting be sure to check out our tips page. If you want more tips like this delivered to your inbox subscribe to our newsletter to see what goes on in the Quilt Room each week. I have long resisted the glove trend as well. A big part was I enjoyed smoking while sewing and you cant do that with gloves on. I've been a nonsmoker for 3 months now, so that's out. I also hate the trend of spending a zillion dollars, so use the ultra machine with special gloves, a supreme slider, etc etc etc made me buck. I do use some of he fingertip moisture stuff they make for file clerks sometimes. Ohhhhh, My mom had the Necchi supernova. It was one of her most prized possessions, she bought her daughters sewing machines early so we would never dream of sitting down with hers. To this day I've never sewn on one, though I collect vintage machines and would like to!